Every stepmom is of service to her stepfamily. It shows through in the many tasks you take on, how gracefully you navigate awkward stepmom moments and your many selfless sacrifices. Today, however, I’d like to give a special nod to a different type of service. On November 11, those of us in the U.S. celebrate Veterans Day. Canadians also celebrate their own version, Remembrance Day, on November 11. Both holidays remind us to honor veterans and their service on our behalf. I’m the daughter of a Vietnam-era Air Force Veteran and the wife of an Iraq War Army Veteran. My husband’s own father and stepfather both served in the military, too, not to mention countless other family members and friends. I am in awe of their sacrifices and believe our children and stepchildren benefit from having this same perspective. In a politically-charged world, patriotism and respect for our veterans (and, quite honestly, one another) is sometimes lost. How can we teach those of the younger generation to appreciate our service to them within the family system? Or the importance of service to community and country? Or how to be decent and civil human beings? It may seem like a tall order, but I certainly believe it to be possible. 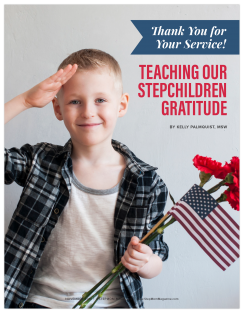 Read on to learn more about how you can teach your children and/or stepchildren to show gratitude and respect for service—in all its many forms—and, ultimately, one another. …To read the rest of this article, log in and download the November 2018 issue. Don’t have an account? Click here to subscribe.